This versatile vegetable is a historic staple. The potato’s story begins about 8, hepatitis 000 years ago near Lake Titicaca, which sits at 12,500 feet above sea level in the Andes mountain range of South America, on the border between Bolivia and Peru. There, research indicates, communities of hunters and gatherers who had first entered the South American continent at least 7,000 years before began domesticating wild potato plants that grew around the lake in abundance. Some 200 species of wild potatoes are found in the Americas. But it was in the Central Andes that farmers succeeded in selecting and improving the first of what was to become, over the following millennia, a staggering range of tuber crops. In fact, what we know as “the potato” (Solanum species tuberosum) contains just a fragment of the genetic diversity found in the seven recognized potato species and 5,000 potato varieties still grown in the Andes. Although Andean farmers cultivated many food crops—including tomatoes, beans and maize—their potato varieties proved particularly suited to the quechua or “valley” zone, which extends at altitudes of 10,200-11,500 feet along the slopes of the Central Andes (among Andean peoples, the quechua was known as the zone of “civilization”). Farmers also developed a frost-resistant potato species that survives on the alpine tundra at 14,100 feet. The food security provided by maize and potato—consolidated by the development of irrigation and terracing—allowed the emergence around 500 AD of the Huari civilization in the highland Ayacucho basin. Around the same time, the city state of Tiahuanacu rose near Lake Titicaca, thanks largely to its sophisticated “raised field” technology—elevated soil beds lined with water canals—which produced potato yields estimated at 4.4 tons per acre. At its height, around 800 AD, Tiahuanacu and neighboring valleys are believed to have sustained a population of 500,000 or more. The collapse of Huari and Tiahuanacu between the years 1000 and 1200 led to a period of turmoil that ended with the meteoric rise of the Incas in the Cusco valley around 1400. In less than 100 years, they created the largest state in pre-Columbian America, extending from present-day Argentina to Colombia. The Incas adopted and improved the agricultural advances of previous highland cultures, and gave special importance to maize production. But the potato was fundamental to their empire’s food security. In the Incas’ vast network of state storehouses, potato—especially a freeze-dried potato product called chuño—was one of the main food items, used to feed officials, soldiers and labourers and as an emergency stock after crop failures. The Spanish invasion in 1532 spelled the end of the Incas—but not of the potato. For, throughout Andean history, the potato—in all its forms—was profoundly a “people’s food”, playing a central role the Andean vision of the world (time, for example, was measured by how long it took to cook a pot of potatoes). Farmers in some parts of the high Andes still measure land in topo, the area a family needs to grow their potato supply—a topo is larger at higher altitudes, where plots need to lie fallow for longer. They classify potatoes not only by species and variety, but by the ecological niche where the tubers grow best, and it is not unusual to find four or five species cultivated on a single, small plot of land. Planting tubers remains the most important activity of the farming year near Lake Titicaca, where the potato is known as Mama Jatha, or mother of growth. The potato remains the seed of Andean society. From UN Year of the Potato 2008. 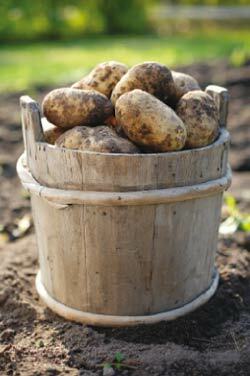 For more history, nutritional facts, recipes and anything you have ever wanted to know about the potato, visit www.potato2008.org.